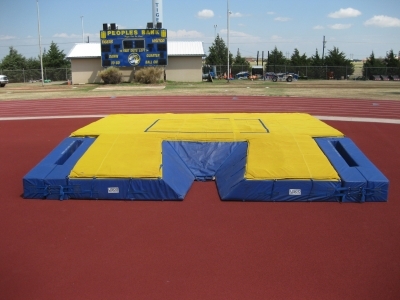 All LISCO pole vault and high jump landing systems are manufactured in the USA using 18 oz coated vinyl and two different grades of first quality foam. The back units on all LISCO pole vault landing systems use a super soft foam on top and a denser foam in the bottom layers. The foam in all LISCO landing systems are glued everywhere foam touches foam, not just on the edges. All LISCO landing systems have drain holes placed every two feet in the bottom of each unit for proper drainage when they get wet. The 2” foam in all LISCO landing cushions is double stitched on the corners to eliminate bunching. Tie downs for both the weather cover and common cushion, on all LISCO landing systems, are affixed every two feet. 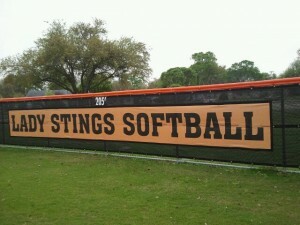 All LISCO pole vault landing systems are available with your option of “C” fronts or “Y” fronts. And, all LISCO landing systems come with a five year limited warranty. All LISCO high jump landing systems are manufactured in the USA using 18 oz coated vinyl and two different grades of first quality foam. The base units on all LISCO high jump landing systems use a super soft foam on top and a denser foam in the bottom layers. The foam in all LISCO landing systems is glued everywhere foam touches foam, not just on the edges. All LISCO landing systems have drain holes placed every two feet in the bottom of each unit for proper drainage when they get wet. The 2” foam in all LISCO landing cushions is twice sewn to eliminate bunching. Tie downs for both the weather cover and common cushion on all LISCO landing systems are placed every two feet. And, all LISCO landing systems come with a five year limited warranty. LISCO can take your old landing system and make it look like new again. 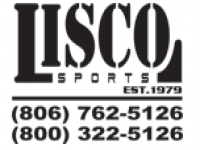 LISCO Recover and Recondition Services include the same high quality vinyl and mesh that are used in our new LISCO Landing Systems. We just use your existing foam when possible to save you hundreds to thousands of dollars over buying a new landing system. 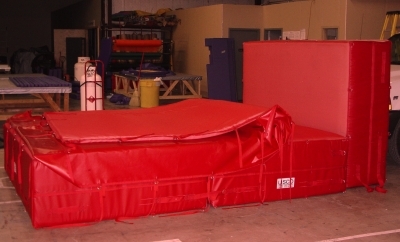 LISCO jump pit covers are manufactured with and without sand bag pockets. Covers with sand bag pockets include sand bags. Covers without sand bag pockets have grommets every 12” for stakes. 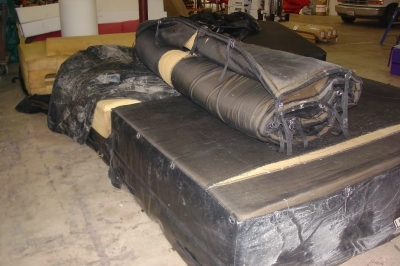 All LISCO jump pit covers are made using vinyl coated polyester mesh for the sand cover with 18 oz coated vinyl sand bag pockets and sand bags. 2” webbing is double stitched around perimeter.